NO VOC's or Petrochemicals!!! This is the 500mL (3.78 L CONTAINER of Hemp Oil. )If doing a kitchen cabinets- you will want to order this larger size! This solvent-free oil finish provides a protective, water-resistant surface. It penetrates to protect from the inside out. 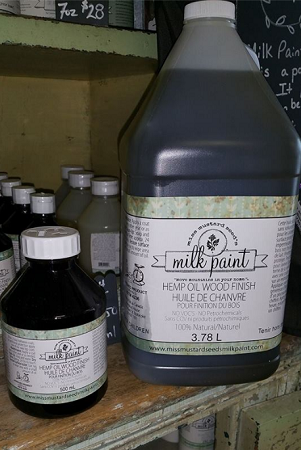 For some newbie's in the painting world- it may be difficult to understand that the Hemp Oil protects your milk painted piece- but it does! It can be used on new wood that is bare, stained, milk-paint wood or to revive old wood effects. This oil does not have a surface film that will chip or scratch. This oil does not need to be cut with any solvents. Since there are no added solvents or dryers to this product, the drying time is longer. The oil will feel dry to the touch one day after the initial application, however complete drying can be several days. For example if there is too much oil initially applied, then small amounts of oil may rise over the first few days. This can be avoided by wiping the excess away with a cloth. If used on a floor during this time it is recommended to place some cardboard pieces where there will be a lot of foot traffic. Dirty shoes should be kept off for at least two weeks. If you have a piece that was PREVIOUSLY painted and Hemp Oil was applied and now...you want to repaint it. Since Hemp Oil acts as a resist....lightly sand. If you had applied a LOT of layers of oil, there will probably be some resisting, with only 1-2 layers typically no resist happens after a few weeks of applying the oil, then applying milk paint. Give it some time to rest, then re apply the milk paint. Hope this helped you. The Purple Painted Lady loves this Hemp Oil! Read the post I wrote about my experience with Hemp Oil here. I was very impressed!!!!! This oil is great for those that suffer from chemical sensitivities and can not use solvent based products. The odor of this oil is much like crushed walnuts. This oil will darken and richen the wood with a soft luster. (Basically- it will darken the wood just like if you were to use a wet rag on a piece of wood....but note it is not staining it. Generally the older the wood the more it will darken it. This will vary based on the type of wood and the age of the wood. It is highly recommended to try a small amount on an area to find out how your project will look with this application. I know the Hemp Oil safety cover is a bit of a pain to open after you unscrew the top off. Miss Mustard Seed has suggested this as the best way to remove it. Place a screw or nail in the center of the metal sealed cap and tap it in with a hammer to create a small home. This releases the pressure in the can and the top can easily be pried off. Hemp Oil works as a resist to the Milk Paint also!!!! So when you are layering two colors, apply the hemp oil in select places, apply a second layer of paint and you will get chipping where the Hemp Oil was applied. It looks awesome, so give it a try! Hemp Oil is not recommended for exterior use, unless applying at least 3 to 4 coats. Ideally, you should Tung Oil, as it is very durable and almost becomes waterproof like a varnish..and it is natural. We will have this oil available soon for order otherwise you can use hemp oil and again, need many coats (3-4) for outside. An exterior grade varnish is great too...however that is not breathable and will eventually crack and peel...not the paint just the top coat which doesn't look so nice and difficult to up keep. This oil does not contain UV protectors, therefore the wood will age, darken and grey. This oil is a great environmentally friendly product as the hemp seeds are grown and pressed in Ontario. 500 ml - Covers aprx 60 square feet 1 Litre - Covers aprx 120 square feet 1 Gallon - Covers aprx 500 square feet 5 Gallons - Covers aprx 2000 square feet * Coverage will vary taking into consideration what the oil is being applied to. For example, a previously oiled surface will require very little oil, where as bare wood will require more. Just keep in mind, a little oil goes a long way. Keep in mind- if using multiple Miss Mustard Seed top coats- here is the order permitted OR a cheat sheet , if you will of which are compatible. Treat all top coats as their own entity that should not be intermixed for the exception of the oils/waxes, and even then you need to know which order. Tough Coat is NOT to be mixed with any other of the top coats in the MMS line, it is incompatible. Use tough coat over milk paint, or bare wood all on its own.